Wow! These Wedding Cookie Favors are spectacular! The perfect Wedding Favor for your guests. 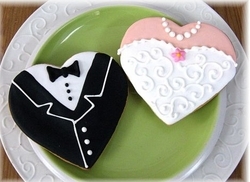 The beautiful Wedding dress and the classic Tux make these Wedding Cookies truly special. These Bride and Groom cookies have can be purchased separately or together as a couple. They are sweet as can be just like the real Bride and Groom! Beautiful Wedding Cookies that taste even better than they look! Classic butter cookies with just a hint of almond that makes it delicious and tender. Our cookies are also available in a gluten-free recipe, please contact us for information and minimum orders. Ingredients for baby shower cookies: flour, sugar, butter, eggs, vanilla, almond extract, baking powder and salt. Ingredients for icing: Powdered sugar, meringue powder, gum Arabic, and cream of tarter. NO PRESERVATIVES! These delicious butter cookie favors frosted with royal icing that dries to a sweet crunchy topping will tickle your fancy and your taste buds. Cookies measure 4" x 4 1/4" and price includes individual cellophane bagging with white tulle ribbon.